As part of Jazz Jackrabbit 2: Birthday Hullabaloo, our old friends at Epic Games have organized another free giveaway! This time around, four five lucky winners will receive free original CDs of Jazz Jackrabbit 2 in jewel cases signed by Arjan Brussee. An additional ten winners will receive free GOG.com download codes for the Jazz Jackrabbit 1 collection, the Jazz Jackrabbit 2 collection, and Epic Pinball. Write a reply in this thread with your favorite memory of Jazz Jackrabbit 2 or its community! Create something inspired by Jazz Jackrabbit 2 or its community, and link to it in this thread. This can be in whatever creative medium you choose... a story, a poem, a drawing, a sculpture, a level, a tileset, whatever! The deadline for submission is Monday, May 14th, 2018. Posting multiple memories or multiple creative works is allowed (and welcome!) but will not affect your number of entries. Thirty memories and zero works are a single entry; one memory and one drawing are two entries. Winners of the signed CD cases will have to submit their mailing addresses to a contact at Epic Games in order to be mailed the cases. Winners of the game codes must have free accounts on GOG.com in order to redeem their prizes. You are also allowed to give your code to a friend instead of using it yourself. All winners will be chosen at random by assembling a list of all qualified entrants, shuffling it, and taking the first fourteen fifteen unique names. Entrants are allowed from any country. Last edited by Violet CLM; May 14, 2018 at 09:59 PM. My favourite memory of the community is working on the LMATs Beyonduary and 2011. Neither set quite got to the finish line (yet?) but I definitely enjoyed working on them and the collaboration was fun. I'm pretty sure I mentioned the word "community" waaaay too much. Welp. Last edited by Primpy; May 12, 2018 at 10:44 PM. An extremely simple one, but as a kid I would hum tunes from the game at school all day (Yes even during class). The game's soundtrack is what stuck with me the most ever since, and when youtube became a thing I would play extended versions of the tracks on repeat while drawing. My favs are the themes from the laboratory level, medieval jam, dark groove, Jazz be damned, and of course the end credits theme. My favorite memory was stumbling on Jazz Jackrabbit while learning how BBS's work. It was one of the first games I downloaded (and then purchased, as I believe it was based on the Shareware model of the time). Really was a fun game and opened doors to the online communities that existed to me. I remember when playing JJ1 with my brother, along with other great games. Every summer we would sit down and play JJ1 and games like DOOM, Blood, Descent, Warcraft 2 and other classics. Never really finished all the episodes as we would start again from the beginning every summer, cool times I still refer to JJ1 as one of the best side-scroller games ever made on PC, I did not love JJ2 that much as it was very tiny compared to JJ1 ( too nice resolution for me ). My favorite memory would have to be the first time trying it and figuring out how it all works. I used to play JJ2 a lot with my sister back in the day. My favorite moments involved when we would finally beat a boss after several tries. It was so satisfying. And because my sis was so young at the time, it would feel awesome when she pulled a clutch move . As a kid born in the 90's Jazz Jackrabbit was one of the first games i ever played. When the sun went down and there was nothing to do with my day anymore i would always fire up the game, sometimes even for the soundtrack alone. My favorite memories as a kid were always music related. And Jazz Jackrabbit fired itself in my memories because there wasn't a single game which had such an amazing soundtrack. Combining it with the multiple themes like castles, the beach, and the christmas theme i felt like i had a whole world to explore. It was the first thing in my life which gave me inspiration to explore, listen, appreciate, and ultimately conquer the enemies. Jazz Jackrabbit was not a simple game for me. It was a complete world which i will never forget. After playing the first Jazz Jackrabbit on my pops DOS computer for years on end, I knew I had to get Jazz Jackrabbit 2 the very moment it was released. That's all there was to it - it was the only way. So as not to feel the horrible burden of being without new Jazz content, I had to get a copy immediately. But how? After all, I was 10 years of age which basically meant n o m o n e y. I did somehow manage to get my hands on the Shareware version - not sure how, probably through my dad asking some of his colleagues - but I knew I had to get the real deal. Up comes April 30. Queen's Day, when us Dutch folks go outside to celebrate the Queen's (or, more recently, King's) birthday or rather, adults celebrate their being allowed to drink outside and kids get caught up in the excitement. More importantly, however, Queen's Day is like a large scale yard sale. Everybody gathers together their old toys, records, and other junk to try make a bit of extra cash. So there went my Thunderbirds' Tracy Island incl. the Thunderbirds themselves, there went my Biker Mice from Mars action figures and Scoreboard Hideout, there went my The Incredible Crash Dummies toy car, and a bunch of other toys I had outgrown. OK some of my favorite memories were back then, when I played the JJ2 shareware episode for the first time. For me, it was a blast! It was like a magic! I played the heck out of the demo and my favorite level was the diamondus one. The demo was SO GOOD and I was SO HYPED that I wanted more! But I wasn't been able to find it anywhere where I live. So I was desperate to find the whole game. Didn't found it at that time. But it was the time where I used a dial up connection to find more about JJ2 related things. The journal site and jazz city were some of those I remember and visited them for news. There was a computer club where JJ2 was installed along other games. I think we even played a bit multiplayer. Later I found TSF and I played that. It was many years later, when I played the initial JJ2 and I was really surprised to find out that the first episode is actually castle and not diamondus! I also have fond memories of making 3 maps back in the days with multiplayer in mind for two of them. One of these, a beach level, is unfortunately lost because it was only on one diskette that is now unrecoverable. Last edited by Roobar; May 7, 2018 at 07:45 AM. I have fonder memories of the first Jazz game because of the colorful SVGA graphics, detailed sprites , great gameplay, and an memorable soundtrack but I do remember seeing Jazz 2 for the first time and how different the game was to the first. Funny how spastic the gameplay could get with the speed and the amount of springs in the level layouts, even a new character named Spazz was added, how appropriate. I've heard there is a lesser known Jazz 3 but dunno if that was official or not but it would have been cool if that 3D Jazz Jackrabbit game that was proposed at one point would have been made. if any character needs a modern revival it is Jazz Jackrabbit. Best memories of Jazz2 I have from when me and my little brother played the racing multiplayer on the same computer, raced against each other again and again. Outcomes of the games weren't that unequal, even though my brother is 4 years younger. Now, after about 15 years, it would be nice to take a rematch, dunno who would win this time. I still know the first time my friend showed me JJ1. It was actually on Easter and there's no way to forgot that. Unfortunately only with a PC speaker. Thought it was like that and I never knew that it actually had an amazing soundtrack, but later on I had some PC with a Sound Blaster clone and I was able to hear music for the first time. I was blown away and that made the game even better for me for me. But I still remember the sound effects beeps. Those cannot be forgotten. Happy 20th Anniversary! And please make another Jazz Jackrabbit! My best memory was me and my cousin playing along together co-op on JJ2, we'd play a lot of other games together too we were always like brothers. But for JJ2 I was Spaz and he played as Jazz. The day I remember pretty vividly was us trying to speed run through levels as fast as possible together. Although on a unrelated note I will say the main menu song is forever stuck in my head too. My best memories are the custom levels (when I was a child I couldn't tell them apart from the names since I didn't understand them, so when I was searching for a specific level I had to browse them all) and the music (I'm still listening to them nowadays!). Thanks for all the played hours! But I also loved the level with the giant carrots, where you could get a parrot. I loved that parrot. Last edited by Lillinettix; May 11, 2018 at 07:31 AM. Oh gosh, back when we were children we only had one computer in my house and one at our neighbour's, my cousin always used to come play Jack Jazz Rabbit or Heroes 3 with my brother while my sister and I watched. At that time we rarely got a chance to play anything since our brother was always on the computer (sucked being the younger sibling at the time, haha) so we often went to our neighbour to play games. With our basic grasp on english we managed to install the game and run it and we actively played it for at least an hour a day, maybe more. If I remember correctly we never actually beat the final boss, our brother just did it for us. I loved the opening cinematic to bits, I thought it was so well animated at the time, haha. I loved the sound effects when selecting anything from the menu and the little pixelated pics at the difficulty setting (baby Spaz, 'nough said), to sum it up, my favourite memory of this game is just the game existing and us being able to enjoy ourselves as kids. Last edited by burekdober; May 9, 2018 at 02:48 AM. JJ2 was my first "real" game that I played on my sister's PC. (good old memories ^^) Unfortunately the game has disappeared in the course of time and I have unfortunately not found it again. The nostalgia I get from the intro and the soundtrack is simply irreplaceable. I was born in the 90's I don't know how JJ2 arrived at my PC but it stuck like a tattoo on my skin and memories. The music, the scenery, the colors, the action, the fun, the characters I remember everything like it was yesterday sharing the keyboard with my big brother, he always picked Jazz and I was always Spaz. He always took all the coins so he could be able to enter those rooms with the good stuff but I never cared I was happy with the feeling of achievement that we could atleast see what was on the other side. We always fought to see which one of us could shoot the birdcage first. I could talk forever about each one of the memories JJ2 gave me and later when my little brother was born we got into the multiplayer maps and it was tons of fun. JJ2 was a HUGE part of my childhood and no matter how old the game gets it's going to be always on my mind until I die. I remember JJ2 as my first game I wanted to play a bit more seriously. I even joined one clan when I was 12-14 It wasn't as serious as it it supposed to be but still I found a few nice people I am still chatting with from time to time (!!). Jazz Jackrabbit 2 probably came out in the worst time possible, when the 3D craze of PC gaming was at its peak. But the art, the cinematics, gameplay and multiplayer features were so damn perfect, that enough people gave it a proper chance. This game introduced me (and many others) to splitscreen online gaming, it opened a new world where you could play your favorite game, and actually make some friends (and improve English) along the way. I remember so well how exciting it was to create your own levels and tilesets, and share them with the world. It was a new way to share your creativity and level design. Extremely addictive. Also, this was one of the first games that had clans. I co-started UJP, which at its peak was pretty big, but probably wasn't as serious as it should have been. It didn't matter, we had so much fun, and the community was just great! And while the game's story was simple, the characters, the world and the community were interesting enough to spawn fanfiction, fanart, and more. I absolutely loved it. So many hours spent, so many positive memories! Happy 20th anniversary! And even after 20 years, I'm still hoping for a sequel, so that both old and new generations can enjoy some updated rabbits with guns! Now that 80's and 90's retro and indie gaming are all the hype, this seems like the perfect time. The GOG re-release is really cool, but as expected, some of Jazz's green hairs have turned grey after 20 years. I have been part of this community for 13 years now, going on 14, so basically two thirds of my life. As cliche as it may sound, I can honestly not imagine my life without this game in it. In reality, just like in the game, people have come and gone and for the better part of my life, I was quite an outcast, so having Jazz Jackrabbit 2 installed and talking to the amazing people here was a huge help to better understand myself, my needs and my faults. At the end of tiring and lonely school days, hearing the familiar tunes of the game, seeing the neverending creative juices flowing and talking to people whom I eventually considered friends were some of the few things which truly made me feel accepted and liked for who I was. I met some amazing people here with whom I eventually became close friends even in real life and, even if we're not friends anymore, they have also helped shape me into who I am today. It's something I will cherish forever. As for my favourite memory, it has to be somewhere around Bash 10. I was so into it that I was having dinner in front of the computer, the server was nearly full and everyone was exceptionally talkative, the vibe was unlike anything I had experienced before. I stood up until late in the night talking about everything, it was really new to me to be so involved in a conversation and even now I can say that that was one of the most important nights of my life. Without Jazz, I'm almost sure I would have missed out on one of the most incredible and welcoming communities out there. Heartfelt congratulations and gratitude to everyone who keeps the story going. I remember making junky Jazz 1 level conversions to Jazz 2 using tileset conversions. So many days spent with a J1E and JCS open, copying the levels over tile-by-tile, finding equivalent (or close) enemies in Jazz 2 for the ones in Jazz 1. Sure, it was a terribly inefficient process. Sure, it wasn't Jazz 1 per se. Sure, they weren't even that great. But this was in a time when it was obscenely hard to legally acquire Jazz 1 and it was a creative outlet I could really get into. I felt I was doing my duty for the community. There's no point to playing my conversions anymore. We have the real thing now, and it's so much better. But it's a lot of work and happy memories for me and it's there if only for posterity's sake. A relic of a time finally gone now when we couldn't have nice things. I suppose that's worth a post. AB20 was nice too. It was the first time I really left my levelmaking bubble and actually experienced the game with the community. And it was my first time back at Jazz for a few years so it was sort of like a homecoming for me. It reminded me how much I love this game, even after I've moved on to other things in recent years. I'm even working on a level or two again, just for the heck of it. It's just so amazing how resilient this community is, and I'm so proud to have been a part of it for ten years now (a mere half of some members here). So that's two memories. Sue me. This game and site have so much more than one memory for me. 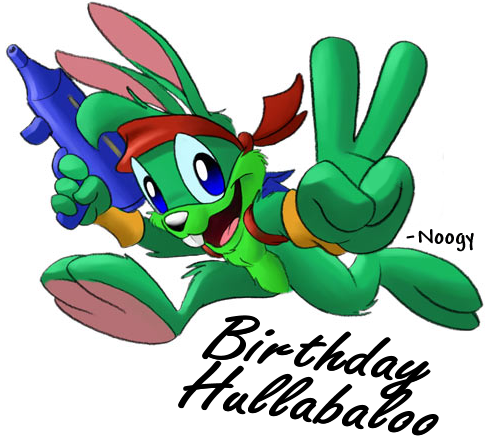 I got into Jazz Jackrabbit 2 at a young age, it was my first online game, and as an awkward kid I could say that my first friends ever were made on Jazz Jackrabbit 2 servers. Before there was Minecraft, VRChat, or Roblox, I was role playing on "hotel" servers and downloading all kinds of maps that people had made as "Psyash" my horrible cringey first username.In one sense Jazz Jackrabbit 2 was the forerunner to the above games I mentioned in user generated content, it's level creator was nothing else at the time and as an aspiring game developer I dabbled in video game development with creating my own tilesets and levels. In a time where I felt like I had very little control over my life as a kid, there was no limits to the levels I could create and this was how I escaped from my situation as a kid. Jazz Jackrabbit 2 was an essential part of my childhood that still stays with me today, learning about people in JJ2 also led me to begin to become better at interacting and learning about people in real life, and for that I am indebted to the game, its developers and this community. I remember playing Jazz Jackrabbit 2 as a kid.Back then I didn't know anything about existence of cheat codes.I admit spawning bees(endlessly)diamondus in jj2 Flashback chapter was more annoying for me than bees from jj1 diamondus.I remember also that some jj2 tsf levels were unfinished because as a kid I played only Jazz Jackrabbit 2 the secret files(in 2002 I guess) and jazz jackrabbit 2 Christmas chronicles(in 2004 in 100%)I played jazz jackrabbit 1 when I was 18 years old(in 2011)back then I wasn't able how to configure music in sound card settings in installation of jj1 later I found on Internet cheat codes probably when I played few more times after first time when I completed a game.I found jj3 demo for a first time as torrent file I never knew back then about this cancelled jj2 sequel.I also played gba jazz jackrabbit remake(gameboy advance emulator of course) and jazz jackrabbit ios demo powered by Unreal Engine 3,but I wasn't satisfied to be honest.I also remember when I wanted to play for a first time jj2 online multiplayer mode(when I was trying) I didn't know back then how to configure npc settings for a first time,but now I know. Last edited by luke11685; May 8, 2018 at 12:25 AM. 1. My favorite memory of Jazz Jackrabbit 2 is when I received the game as a gift from my parents. I was eight years old, and had been at a friend's birthday party when my mother picked me up. The internet wasn't such a big thing those days, but I had found about a sequel being developed for my favorite game (Jazz 1 of course . However I wasn't aware it had just been released. My parents had spotted the game in a store, and knowing I was a fan had bought it for me. I still remember seeing the outlines of the title "Jazz Jackrabbit 2" through the white plastic bag in which my mother gave the game to me. I was so excited, it left a lasting impression. My favourite memories would be playing Jazz 2 as my first ever online game. Endlessly browsing Jazz 2 City for levels. I would host servers and, being young, not understand that the ping for most people to Australia meant I had a ridiculous advantage. I would play non-stop Crimson Diamond and Hells Angels. I learned to make levels and was incredibly proud when they made it into Bash packs (Here and here for the curious). And most importantly, I made friends who I still talk to today. And a few whom I've sadly long lost touch with. My most vivid memory is playing the Jazz Jackrabbit 2 Christmas levels over Christmas time. The idea of themed levels I could download was just mindblowing for young me. I also remember JJ2 being incredibly impressive in resolution, in contrast to the original JJ. Probably also one of the first games I played that didn't come on floppies. Magical times. Oh jeez, so many good memories for Jazz 2. I guess my best memory was the time me and my friends were having a LAN party, and ended up playing party mode into the wee hours. it was an absolute blast, way more fun than we were having with Quake. 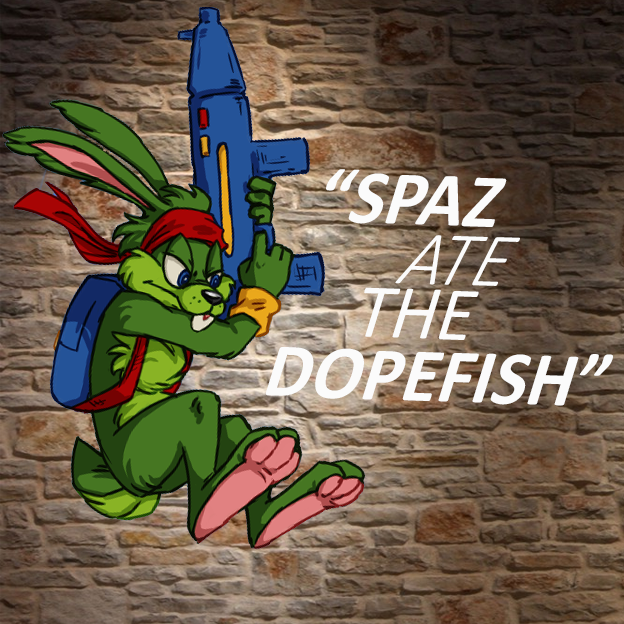 I think my best memories on Jazz Jackrabbit 2 are when my sister and I (she played Spaz and I played Jazz) entered a new level. We were quite young (5 and 8 I think) and both scared about what we would discover while playing on the same keyboard. I remember the witch level we had trouble handling, or the joy to discover our heroes could go into water ! And, in a short time after, I remember us retrying the game again and again before dying on that exact same point : a robot shaped boss I think, that we never succeeded in going through. I think my strongest memory of JJ2 was just as I was fighting Uterus. I played on my parents' computer back then and they've just migrated from Win98 to ME, and the moment I killed Uterus an error message popped up and my save got corrupted. I played with Jazz and I was a bit miffed, to say the least - as in my mind that was the end of the saga I started with Jazz Jackrabbit 1. The day after, I started a new game, this time with Spaz. Experiencing the same exploration puzzles between Jazz and Spaz back to back really burned it into my mind how good the level design of JJ2 was. I think the crash is the most angry I've been with JJ2, and the first stage epiphany is the most amazed I was. Hi, thanks for the chance to win this special gift. My favorite Jazz2 related memory is probably the one where I rediscovered the game after some years. I had originally played the demo when it was new, but never owned the full game back then unfortunately. I remember being super excited about finding out that OMF 2097 featured an ad for the first game. Anyway, back in the summer of 2003, a few years after the game had stopped being sold and I couldn't get a copy of it, I eventually tracked it down on an old but well-known abandonware website of the time, HOTU or The Home of the Underdogs. Filesize was roughly around 35MB for the entire game, which didn't include the animated cutscenes unfortunately, but I couldn't care less. I remember that it was around 8PM when I started downloading, but with a measly 56K dial-up connection, this took a few hours. I was very young at the time and my computer was in my parents' room, so I had to ask for permission to both let the Internet connection run for a few hours and let the PC running during the duration of the download. I had to use the GetRight download manager as well, just to make sure it didn't crap out on me midway through . The waiting was just killing me. Thankfully, I remember that we did have guests that night at the house so I was occupied during that time. I think that it eventually finished around 12:30-1:00 AM, but of course it was too late and I had to go to bed, so I just turned the computer off and went to sleep . I remember anxiously trying to sleep, hoping that the game would run and that the entire wait was not wasted. Got up in the morning and first thing I did was fire up the PC and test the game. When I saw it running, I was so incredibly happy, I just couldn't believe it that I could finally play that game in full. I probably spent that entire weekend playing the game and I think soon thereafter I found a copy of The Secret Files as well, which made me immensely happy as well. Fast forward a few years later and around 2011 I finally got a legitimate, big box copy of the game! I want to thank everyone who worked on these games from the bottom of my heart, they made me so happy as a kid and I had a total blast playing through them! The cinematics in both Jazz 1 & 2 were the icing on the cake. And that music... some of these tracks still spring to mind randomly! I used to love playing JJ2. I remember we bought it at some kiosk at the mall and played it on my friend's old computer (486 possibly?) We were 8 or 9 at the time.. funky little game it is. I've been here a while, and there are more than a few memories I could bring up here, but I keep coming back to that experience when I first started playing JJ2 online in 1999/2000. I would go home during lunch break and boot up JJ2, and inevitably there'd be some people online who I'd just hang out with virtually. We had only just gotten cable internet and this was my first experience with online gaming. I was still in primary school at the time and it was super exciting to meet new people - many from The Netherlands, but also people from other countries - this way. We had a bit of a group of Dutch people playing the game and while I'm no longer in touch with them, those days were a lot of fun. Some of that feeling still persists here, which is part of the reason I'm still around, and I do believe the JJ2 scene is a little special in that regard. To be truthfully honest I've never played Jazz Jackrabbit. However I've always wanted to play it. This would be great to win as my birthday is in May so here's to hoping. I have much fond memories associated with Jazz Jackrabbit. I was born in the early 90's in Poland, where access to games was rather difficult (especially in small towns) and JJ 1 was my second game I've ever played (still remember that floppy disc). The Tubelectric level and music have rooted themselves so deep in my memory, that I can still recall it in retrospect. The brilliant OST by Robert Allen is also present in my phone for some time already (Fanolint and Scraparap are my favourite). As for the creative department, I've managed to familiarize my younger brother with JJ2 in the past, so there will be some private stuff with sentimental value. The first, is a birthday card, he gave me to commemorate my favourite games of the past. (Jazz is obviously symbolised by the green ears of the flying Worm). 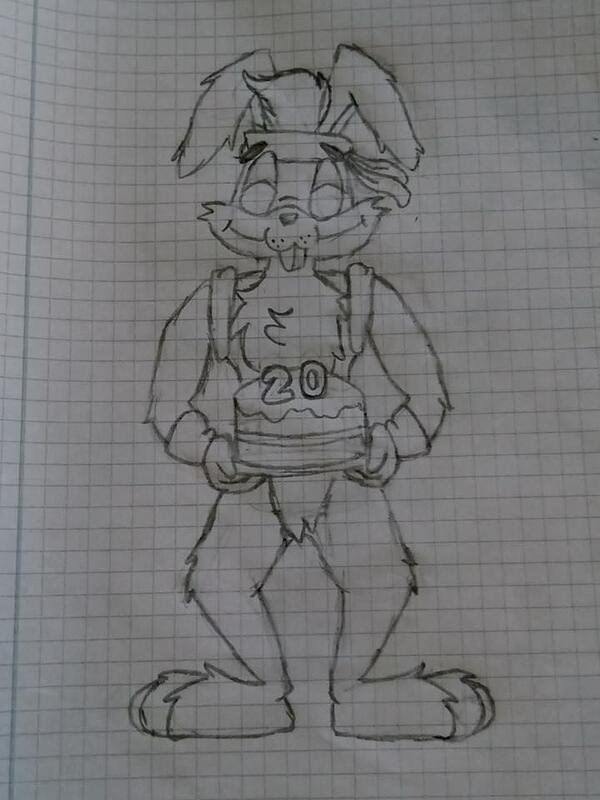 Next, is his first attempt to draw Spaz.